Dr J Dumortier, INSERM Unité 45, pavillon Hbis, Hôpital Edouard Herriot, 69437 Lyon Cedex 03, France. BACKGROUND/AIMS Nodular regenerative hyperplasia of the liver is a histological lesion usually associated with systemic diseases, haematological malignancies, or drugs. Its prognosis depends on portal hypertension, which usually is well tolerated and requires medical management only. PATIENTS Three unrelated families, in which two sibling adult male patients presented with nodular regenerative hyperplasia of the liver, were studied. METHODS Complete clinical charts and liver biopsy specimens were available for all patients. In addition, explanted livers were available for examination for the two transplanted patients. RESULTS There was no evidence of any of the various clinical situations known to be associated with nodular regenerative hyperplasia of the liver. Portal hypertension was severe, requiring surgical treatment in two cases. Renal lesions were present in three patients. In two patients, progressive evolution to liver atrophy and hepatic failure, associated with renal failure, led to combined liver and renal transplantation. CONCLUSIONS This report describes the existence of familial cases of nodular regenerative hyperplasia of the liver, occurring without underlying or associated systemic disease, characterised by a poor clinical course and often associated with progressive renal failure. We here report the occurrence of liver lesions typical of NRHL in several members of three unrelated families. Besides their highly unusual familial occurrence, these cases of NRHL are also characterised by: (a) the absence of associated systemic disease or exposure to potentially toxic agents; (b) poor clinical progress, related to severe portal hypertension, leading to orthotopic liver transplantation in two patients; and (c) the existence of vascular alterations involving other organs, such as the kidney. The present report is based on six patients, belonging to three unrelated families, for whom the diagnosis of NRHL was made between 1987 and 1993. For all patients, complete clinical charts were available. Liver biopsy specimens were obtained from all patients. In addition, explanted livers were available for examination for the two transplanted patients. Sections from formalin fixed paraffin embedded liver tissue were stained with haematoxylin and fuchsin, chromotrope, Perls’ iron stain, and Masson’s reticulin. Table 1 gives the salient clinical findings for each patient, and table 2 gives the liver function tests and results of computed tomography and endoscopic examination. No patient presented with a history of alcohol abuse, chronic hepatic disease, or blood transfusions. There was no sign of autoimmune or connective tissue disease. The patients were not taking any drugs at time of admission. Hepatitis B surface antigen and anti-HBs and anti-HBc antibodies were absent. Hepatitis C virus serology was negative. Anti-nuclear, anti-mitochondrial, anti-smooth muscle, and anti-endoplasmic reticulum antibodies were not detectable. Serum concentrations of ferritin, copper, caeruloplasmin, α1 antitrypsin, and α fetoprotein were within the normal limits. Serum protein electrophoresis and immunoelectrophoresis were normal. Rheumatoid factor was not detectable. For all patients, there was no abnormality in the coagulation cascade. We summarise below the clinical histories of each patient. In this family, two brothers presented with NRHL. The patient was admitted to our hospital in October 1987, at the age of 40 years, for haematemesis. Upper gastrointestinal endoscopy confirmed the source of bleeding as oesophageal varices. The bleeding was not controlled by conservative measures and oesophageal transection was performed. On physical examination, there was a hepatomegaly and a splenomegaly. Abdominal ultrasonography confirmed the existence of hepatosplenomegaly and showed an enlarged splenic vein. Portal and hepatic vein patency was assessed by ultrasonographic pulsed Doppler. A transjugular hepatic biopsy specimen was taken for histological examination. Two other percutaneous hepatic biopsies were performed in 1987 and 1988. Between 1988 and 1989, injection sclerotherapy was needed to achieve complete eradication of oesophageal varices. The patient was admitted again in September 1990 for a recurrence of oesophageal variceal bleeding. A decision to treat surgically was taken. A lateral mesenterico-caval shunt was performed. At surgery, a portal vein thrombosis was discovered and confirmed by peroperative ultrasonography. Macroscopically, the liver was atrophic and presented a markedly irregular surface. Because of a thrombotic obstruction of the first shunt, a new shunt was inserted in March 1991. From 1991 to 1997, there was no further gastrointestinal bleeding. In 1997, at the age of 57, the patient presented with an episode of hepatic encephalopathy. A full blood count showed pancytopenia. The prothrombin index was 64%. There was no recurrence of oesophageal varices. Abdominal ultrasonography showed no ascites and no sign of portal hypertension. A third hepatic biopsy was performed. At the date of submission of the manuscript, the patient is alive with recurrent episodes of hepatic encephalopathy. This 59 year old white man was referred to our department in December 1992 because of the incidental endoscopic diagnosis of oesophageal varices. A treatment combining propranolol adminstration and injection sclerotherapy was begun. A percutaneous hepatic biopsy specimen was taken for histological examination. In 1995, at the age of 62, the patient progressively developed ascites and hepatic encephalopathy. Physical examination disclosed splenomegaly. There was no jaundice. A full blood count showed pancytopenia. The prothrombin index was 66%. Abdominal ultrasonography with pulsed Doppler confirmed the existence of ascites and splenomegaly and showed an atrophic liver. There was evidence of large collateral venous channels within the abdomen. The coeliac and superior mesenteric angiograms showed a tortuous splenic vein with retrograde flow down the superior mesenteric vein communicating with the inferior vena cava. Portal and hepatic veins were patent. Upper gastrointestinal endoscopy confirmed eradication of oesophageal varices. In addition to symptoms related to hepatocellular insufficiency and portal hypertension, the patient also showed signs of altered renal function. Serum creatinine levels were increased to 168 mmol/l (normal range 55–120). Creatinine clearance was 59 ml/min. Haematuria and proteinuria were present. Examination of a renal biopsy specimen showed severe nephroangiosclerosis of vascular origin. Further clinical progress was poor, with recurrent episodes of tense ascites and encephalopathy and progressive degradation of renal function leading to renal insufficiency. A decision to carry out combined liver and renal transplantation was taken in December 1995. The combined transplantation was performed in January 1996. The recovery was uneventful. At the date of submission of the manuscript, the patient is alive, without symptoms of hepatic or renal disease. Two brothers of this family presented with NRHL. Both were HLA A1B7. Their mother died at the age of 56 from hepatic failure of unknown cause. This 40 year old white man was referred in October 1987 for diagnostic evaluation after the incidental discovery of abnormal liver tests. A first surgical hepatic biopsy specimen was taken for histological examination, during treatment of an inguinal hernia. Upper gastrointestinal endoscopy showed oesophageal varices, which were treated by injection sclerotherapy. A percutaneous hepatic biopsy specimen was taken for histological examination. In addition to abnormal liver tests and signs of portal hypertension, the patient also exhibited haematuria and proteinuria. From 1988 to 1996, regular follow up showed the persistence of abnormal liver tests and a progressive alteration of renal function. No further clinical complications occurred. In March 1996, upper gastrointestinal endoscopy and abdominal ultrasonography showed aggravation of portal hypertension. A decision to treat surgically was taken and a lateral mesenterico-caval shunt was performed in September 1996. At this time, a second surgical hepatic biopsy specimen was taken for histological examination. Further clinical progress was poor. The patient had chronic oedema and suffered several episodes of hepatic encephalopathy. Renal insufficiency developed. A renal needle biopsy specimen showed non-specific lesions of nephroangiosclerosis. A decision to carry out combined liver and kidney transplantation was taken in March 1997. The transplantation was performed in December 1997. At surgery, the mesenterico-caval shunt was found to be permeable, without any evidence of thrombosis. After transplantation, the recovery was uneventful. At the date of submission of the manuscript, the patient is alive without evidence of hepatic or renal disease. This 38 year old white man was seen in April 1990 for diagnostic evaluation of an isolated increase in serum aminotransferase levels. Upper gastrointestinal endoscopy showed no evidence of oesophageal varices. Abdominal ultrasonography showed hepatomegaly. A percutaneous liver biopsy was performed. Regular follow up between 1990 and 1996 diagnosed no further clinical or biological abnormalities. In September 1996, renal tests were found to be abnormal. Serum creatinine level was increased to 135 mmol/l (normal range 55–120). Haematuria and proteinuria were present. In September 1997, the serum creatinine level was further increased to 220 mmol/l, and creatinine clearance was 45 ml/min. A renal needle biopsy specimen was obtained and showed nephroangiosclerosis. At the date of submission of the manuscript, the patient is alive. The patient was first admitted in July 1992, at the age of 28, for leucothrombocytopenia. Upper gastrointestinal endoscopy showed oesophageal varices. Physical examination disclosed hepatomegaly and splenomegaly. Abdominal ultrasonography confirmed the existence of hepatosplenomegaly and showed an enlarged splenic vein. Portal and hepatic vein patency was documented by ultrasonographic pulsed Doppler. A percutaneous hepatic biopsy specimen was taken for histological examination. Propranolol, 160 mg a day, was begun. From 1992 to 1998, there was no gastrointestinal bleeding. Thrombosis of the left portal vein was diagnosed in February 1998. This 33 year old white man was referred in October 1993 for haematemesis. Upper gastrointestinal endoscopy confirmed the source of bleeding as oesophageal varices. The bleeding was controlled by conservative measures. On physical examination, there was a hepatomegaly and a splenomegaly, confirmed by abdominal ultrasonography. Portal and hepatic vein patency was documented by ultrasonographic pulsed Doppler. A percutaneous hepatic biopsy specimen was taken for histological examination. Between 1993 and 1994, injection sclerotherapy was needed to achieve complete eradication of oesophageal varices. Propranolol, 160 mg a day, was begun. The patient was admitted again in October 1996 for a recurrence of oesophageal variceal bleeding. From 1996 to 1998, there was no further gastrointestinal bleeding despite the persistence of oesophageal varices. In all cases, examination of liver biopsy specimens showed diagnostic features of nodular regenerative hyperplasia. The overall architecture of the liver was distorted by the presence of small nodules of hepatocytes directly merging into the adajcent liver parenchyma (fig 1). Low power magnification of a liver biopsy sample from patient 2. Two distinct regenerative nodules, separated by compressed hepatocytic plates, are well visible. Haematoxylin-fuchsin stain; original magnification × 120. Within hepatic nodules, hepatocytes were usually swollen and enlarged. They were organised into plates of irregular thickness, separated by well differentiated sinusoid vessels. The periphery of the nodules was outlined by compressed and sometimes atrophic hepatocytic plates, best visualised by using reticulin stains (fig 2). No fibrous capsule was detectable. The nodules were separated by dilated sinusoid vessels. On biopsy specimens, no occlusive vascular lesion was observed. No abnormality in portal vessels and centrolobular veins was detected. On the liver explant from patient 2, the typical pattern of nodular regenerative hyperplasia of the liver is well visualised by the reticulin stain. A regenerative nodule is surrounded by atrophic and disorganised hepatocytic plates. Masson’s reticulin stain; original magnification × 80. When successive biopsy specimens were available from the same patient (cases 2 and 3), no significant modification of the histological appearance was observed. In the two transplanted patients (cases 1 and 3), explanted livers were available for examination. In patient 1, the liver (1040 g) was atrophic and markedly cholestatic. Cut sections had a distinctive nodular appearance. At histological examination, the diagnosis of NRHL was confirmed. The overall parenchyma was distorted by small hepatocytic nodules, separated by compressed and atrophic liver plates. Within regenerative nodules, the presence of large hepatocytes with voluminous and nucleolated nuclei was noted. Additional features included severe cholestasis with numerous intracanalicular biliary thrombi and slight haemosiderosis. Despite careful examination, no vascular occlusion was detected. No abnormality of portal vessels or centrilobular veins was observed. The explanted liver of patient 3 weighed 1520 g. Cut sections had a distinctive nodular appearance. Large haemorrhagic foci were disseminated within the parenchyma. At histological examination, the diagnosis of NRHL was confirmed. Small regenerative hepatocytic nodules were diffusely distributed within the overall parenchyma. Mild cholestasis was common. In some nodules, hepatocytes were considerably enlarged and had large irregular heavily nucleolated nuclei, reminiscent of those observed in large cell dysplasia (fig 3). In the peripheral regions of the liver, additional architectural abnormalities were observed. A proportion of portal tracts was enlarged by non-inflammatory periportal fibrosis, associated with mild neoductular proliferation. In some instances, bridging fibrosis between adjacent portal tracts could be observed (fig 4). 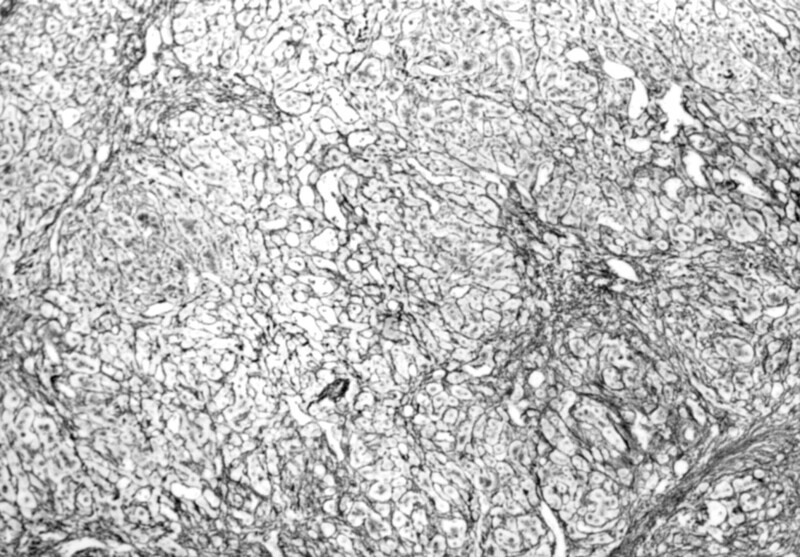 In the subcapsular region, bridging fibrosis resulted in the formation of thick fibrous bands separating small regenerative nodules. Careful examination of large hepatic vessels showed the existence of two organised thrombotic occlusions, located within large intrahepatic branches of the portal vein. In addition, numerous dilated venous and lymphatic vessels, sometimes lined by a thickened and fibrotic wall, were present in the large perihilar portal tracts. In patient 3, foci of hepatocytes with pseudo-dysplastic features are present. Haematoxylin-fuchsin stain; original magnification × 250. 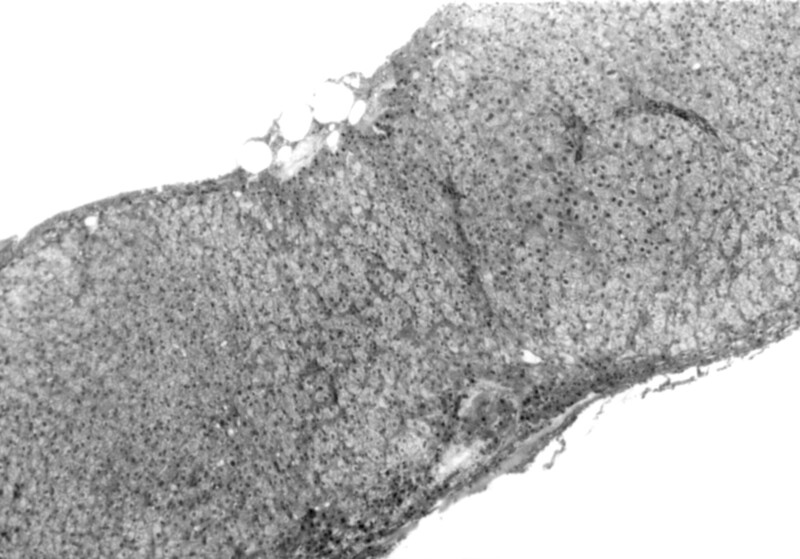 Low power magnification of the subcapsular area of the liver explant obtained from patient 3. The overall architecture is distorted by extensive fibrotic septa. Masson’s reticulin stain; original magnification × 60. We report the occurrence in three unrelated families of a syndrome associating nodular regenerative hyperplasia of the liver and severe portal hypertension. Clinical progress was usually poor and justified combined liver and renal transplantation in two patients. To the best of our knowledge, the familial occurrence of NRHL has not been reported so far. However, three previous reports have documented familial cases of hepatoportal sclerosis17 18 and incomplete septal cirrhosis,19 which are usually considered to be closely related to NRHL and may be part of the same spectrum of liver lesions. Interestingly, cytological features like those observed in large cell dysplasia were observed in two of our patients. The occurrence of such dysplastic features has been previously reported in other cases of NRHL or related histological lesions, such as incomplete septal cirrhosis.24 In certain series of NRHL, the incidence of dysplasia amounted to 40% of cases.9 Its exact significance is unknown but it is likely to be related to the increased proliferative activity of hepatocytes constituting the regenerative nodules. NHRL is currently thought to be secondary to microcirculatory disturbances within the liver parenchyma, inducing successive episodes of atrophy followed by compensatory regeneration.16Several lines of evidence suggest that vascular lesions may actually be involved in the pathogenesis of the lesions observed in our patients. As in several previous cases of NRHL,4 9 thrombotic occlusions of the portal vein or its large branches were found in three of our patients. It is not possible to exclude the existence of liver vascular lesions in the other patients, as the focal nature of their distribution may result in their misdiagnosis. In addition, several of our patients presented with lesions of vascular origin involving other organs. One patient had myocardiopathy and Raynaud’s phenomenon. Three others had progressive renal failure, related to nephroangiosclerosis of vascular origin. In two of these patients, renal transplantation was required. The association between NRHL and renal failure has been previously noted,35 36 and reinforces the concept that some cases of NRHL may be part of a multiorgan involvement of the microcirculation. In conclusion, this report points out the existence of familial cases of NRHL, occurring without underlying or associated systemic disease, characterised by a poor clinical course leading to severe portal hypertension and progressive hepatocellular insufficiency requiring liver transplantation, and often associated with progressive renal failure requiring kidney transplantation. We are grateful to Mrs M F Jacquier (INSERM U45, Lyon, France) for her help with preparation of the figures and to Dr T Bizollon (Hotel-Dieu, Lyon, France) for helpful discussions about NRHL. (1959) Nodular regenerative hyperplasia of the liver. Am J Pathol 35:943–953. (1953) Miliary hepatocellular adenomatosis. Acta Pathol Microbiol Scand 33:225–229. (1981) Nodular transformation (nodular “regenerative” hyperplasia) of the liver. A clinicopathologic study of 30 cases. Hum Pathol 12:60–71. (1990) Micronodular transformation (nodular regenerative hyperplasia) of the liver: a report of 64 cases among 2,500 autopsies and a new classification of benign hepatocellular nodules. Hepatology 11:787–797. (1974) Nodular regenerative hyperplasia of the liver in Felty’s syndrome. Q J Med 43:25–32. (1974) Nodular, non-cirrhotic liver associated with portal hypertension in a patient with rheumatoid arthritis. J Clin Pathol 27:963–966. (1988) Peliosis hepatis, nodular regenerative hyperplasia of the liver, and light-chain deposition in a patient with Waldenstrom’s macroglobulinemia. Gastroenterology 95:482–486. (1989) Nodular regenerative hyperplasia of the liver, CREST syndrome and primary biliary cirrhosis: an overlap syndrome? Gut 30:1430–1433. 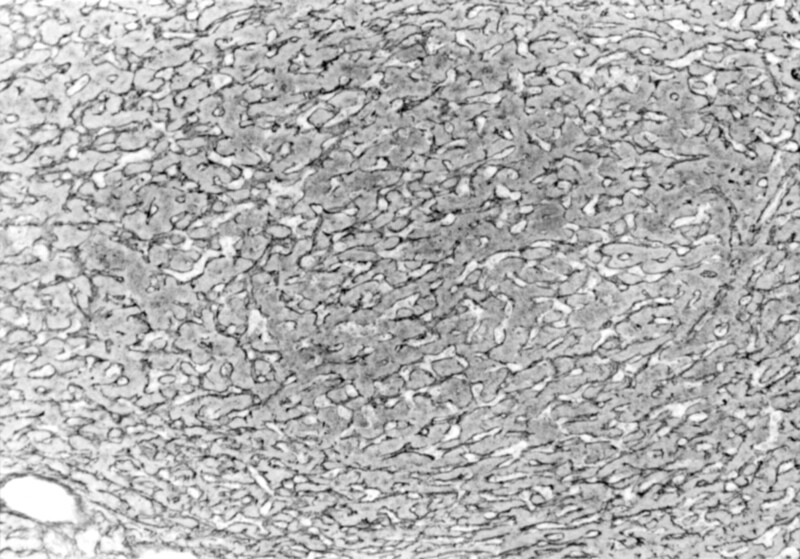 (1989) Diffuse nodular regenerative hyperplasia of the liver (DNRH). A clinicopathologic study of 24 cases. Liver 9:253–265. (1990) Nodular regenerative hyperplasia of the liver, peliosis hepatis, and perisinusoidal fibrosis. Association with angioimmunoblastic lymphadenopathy and severe hypoxemia. Gastroenterology 99:268–273. (1988) Three cases of nodular regenerative hyperplasia of the liver following renal transplantation. Nephrol Dial Transplant 3:327–330. (1981) Nodular regenerative hyperplasia of the liver following renal transplantation. Dig Dis Sci 26:271–274. (1994) Nodular regenerative hyperplasia of the liver graft after liver transplantation. Hepatology 20:88–94. 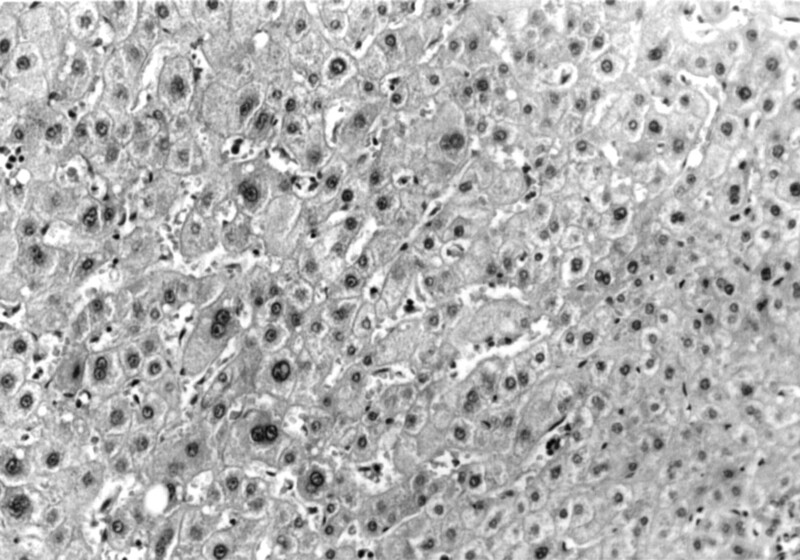 (1991) Azathioprine induced liver disease: nodular regenerative hyperplasia of the liver and perivenous fibrosis in a patient treated for multiple sclerosis. Gut 32:715–717. (1986) Nodular regenerative hyperplasia of the liver associated with the toxic oil syndrome: report of five cases. Hepatology 6:687–693. (1980) Nodular regenerative hyperplasia of the liver in hematologic disorders: a possible response to obliterative portal venopathy. A morphometric study of nine cases with an hypothesis on the pathogenesis. Medicine (Baltimore) 59:367–379. (1997) Hepatoportal sclerosis: apropos of a familial case. Arch Pediatr 4:251–254. (1987) Familial aggregation in noncirrhotic portal fibrosis: a report of four families. Am J Gastroenterol 82:1130–1133. (1992) A familial form of incomplete septal cirrhosis. Gastroenterology 102:674–678. (1993) Idiopathic portal hypertension; a histopathological study of 26 Japanese cases. Histopathology 22:227–234. (1988) Incomplete septal cirrhosis: histopathological aspects. Histopathology 13:593–603. (1990) Nodular regenerative hyperplasia of the liver: retrospective survey in autopsy series. J Clin Gastroenterol 12:460–465. (1995) Progression from idiopathic portal hypertension to incomplete septal cirrhosis with liver failure requiring liver transplantation. J Hepatol 22:495–499. (1990) Late recurrence of a hepatocellular carcinoma in a patient with incomplete Alagille syndrome. Gastroenterology 99:1514–1516. (1982) Intrahepatic portal vein sclerosis in patients without a history of liver disease. An autopsy study. Am J Pathol 106:63–70. (1987) Nodular regenerative hyperplasia of the liver associated with idiopathic membranous glomerulonephritis. Am J Gastroenterol 82:677–680. (1991) Nodular regenerative hyperplasia of the liver and the Budd-Chiari syndrome. Case report, review of the literature and reappraisal of pathogenesis. J Hepatol 12:28–35. (1994) Nodular regenerative hyperplasia: a controversial indication for orthotopic liver transplantation. Transpl Int 7:309–313. (1990) Nodular regenerative hyperplasia mimicking cirrhosis of the liver. Gut 31:725–727. (1979) Idiopathic portal hypertension (perisinusoidal fibrosis) after renal transplantation. Gut 20:531–537. (1978) Nodular regenerative hyperplasia of the liver. Report of six cases and review of the literature. Gastroenterology 75:169–172. (1991) Nodular regenerative hyperplasia of the liver in children. Am J Surg Pathol 15:449–454. (1986) Diffuse nodular hyperplasia and fibrosis of the liver in lead-poisoned mandrills. J Med Primatol 15:245–258. (1992) Nodular regenerative hyperplasia in the rat induced by a selenium- enriched diet: study of a model. Hepatology 16:418–425. (1996) Nodular regenerative hyperplasia of the liver in a patient with systemic sclerosis. Clin Rheumatol 15:613–616. (1991) Nodular regenerative hyperplasia of the liver in a non-treated patient with mesangiocapillary glomerulonephritis. Histopathology 18:367–368.